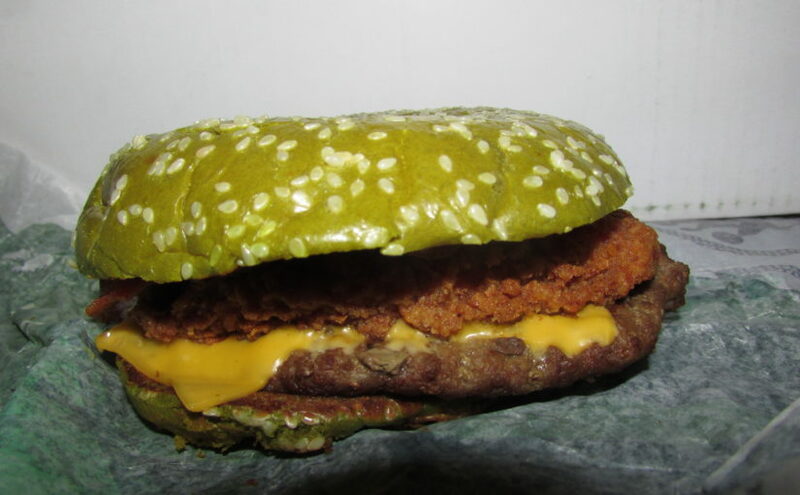 The green sesame seed bun is gross in itself. Halloween brings on many unhealthy habits — eating candy, drinking and not caring about the after effects of any of it — but this has got to be the unhealthiest of them all. “The Nightmare King” is now offered at select Burger Kings until Halloween or while supplies last. This nightmare burger has everything from a green bun to three different types of meats, all in one greasy sandwich. If the green sesame seed bun doesn’t deter you, think about the ¼-pound beef patty, fried chicken fillet, couple pieces of bacon and, to top it off, American cheese, mayonnaise and onions. We all know by now that advertisements make the product look prettier than it is, but in this ad, it barely looks appetizing with the artificial green and the creepy hand coming across to advertise the spooky season. The product looks even scarier when you unwrap it in person. The green is nothing like the advertising suggests. It looks like a mixture of green vomit and baby s—. Once you take a bite, you can tell it is too much of everything. The only thing that makes it at all appetizing is the melted American cheese and the minimal amount of mayonnaise, which both try and average out the three layers of meat your body is trying to digest. 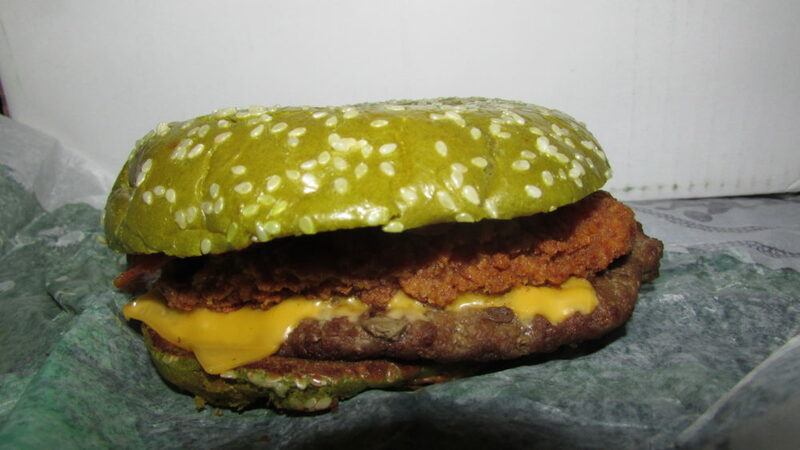 Honestly, Burger King would have been better off selling the classic Whopper with a green bun or brought back the old black bun instead. They could have worked on the coloring more if they did this and saved chicken for another sandwich because the chicken just makes the product too much. In the advertisement, professionals talk about how foods affect dreams and then conduct a study on multiple people, hooking them up to machines to see whether or not they have nightmares after eating the Nightmare King. They did this study for 10 nights on 10 different subjects. Now, I usually remember my dreams or can sense when I’ve had a nightmare because I have nightmares frequently. After eating the burger, I felt like I went into a food coma, whether that was from all the different types of meats or lack of sleep, who knows, but there was no nightmare that I can recall. I’m sure if this study is real (which I’m not saying it is or not), that after eating a burger for 10 nights anyone would be having nightmares. The only thing that will give students a nightmare is the price. For a regular sized meal of the Nightmare King, it is a little over $9 with tax. So, save yourself the trip and go somewhere else, unless you want to test whether you will have a nightmare or not.